A friend of mine has a charming and sweet 13 year old daughter who unfortunately has celiac disease. The fortunate part is that he knows food well after managing a restaurant and helping to start another. With his food background, he has been able to find really good recipes and modify them when necessary to make them safe for his daughter to eat. 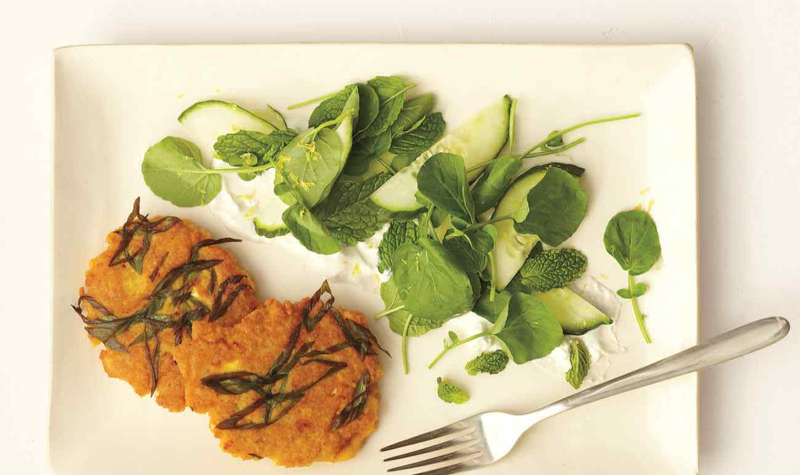 The lentil cakes with feta yogurt sauce and cucumber-cress salad from Martha Stewart is one of these recipes. I have adapted it further to fit the low FODMAP diet, which is recommended for those with the digestive disorders fructose malabsorption and irritable bowel syndrome. Another good aspect of this recipe is that it takes only 30 minutes to prepare. Perfect after a long day of work. The sauce is not necessary since the patties are very moist. Frying is best, but a high oven heat should also work as long as you can flip them. Below is the recipe. I hope you enjoy it. Cover lentils with 2 inches cold water. Soak 4 hours at room temperature or up to 1 day in refrigerator. Drain well. Pulse pale-green and white parts of scallions in a food processor until minced. Add harissa, turmeric, baking powder, 1/4 teaspoon salt, and egg and egg white; pulse to combine. Add lentils; puree until almost smooth. Transfer mixture to a bowl, and stir in a little more than half the feta. Whisk remaining feta, the yogurt, lemon juice, and garlic in a small bowl. Combine cucumber, cress, and mint in another bowl. Heat 1 teaspoon oil in a large nonstick skillet over medium-high heat. Place a scant tablespoon of scallion greens in pan, and spoon about an eighth of the batter on top, spreading to make a 3-inch cake. Repeat, making 4 cakes at a time. Cook until golden brown, flipping once, about 6 minutes. Add remaining teaspoon oil, and repeat. Divide sauce among 4 plates; top with salad. Place cakes next to greens, and serve. Next Why Is There Sugar in My Processed Foods?